As the seasons change, it’s more important than ever to pay attention to your skincare routine, and with a wide selection of men’s grooming products available at The Royal Exchange, it’s easy to update your regime to suit your current look. Bamford Grooming Department recently joined The Royal Exchange, offering a stylish selection of natural skincare products for the modern gentleman to add to his bathroom cabinet. The Edition 1 Shave Oil (£30) will ensure your skin is kept hydrated and protected with a blend of antioxidant and omega-rich blackcurrant, echium and borage oils. Its light but warming fragrance will enhance your shaving experience with the scent of fresh vetiver, bergamot and cassis, blended with wood smoke, amber and leather. Another way to achieve the feel of a fresh barber’s shave at home is with Penhaligon’s Nickel Shaving Brush (£62). Made from ethically sourced badger hair, the ergonomic shaving brush is the perfect accompaniment to Penhaligon’s variety of traditional shaving creams, helping you work up a luscious lather for a smooth and comfortable grooming session. For those who prefer well-groomed facial hair, or to alternate between a bit of beard growth and a clean shave, Penhaligon’s Bayolea Beard and Shave Oil (£48) is a versatile addition to your collection of grooming products. Containing a nourishing blend of sunflower, grape seed and wheat germ, massage three drops of the oil into your skin to prepare for shaving, or apply four drops to smooth and condition your beard. 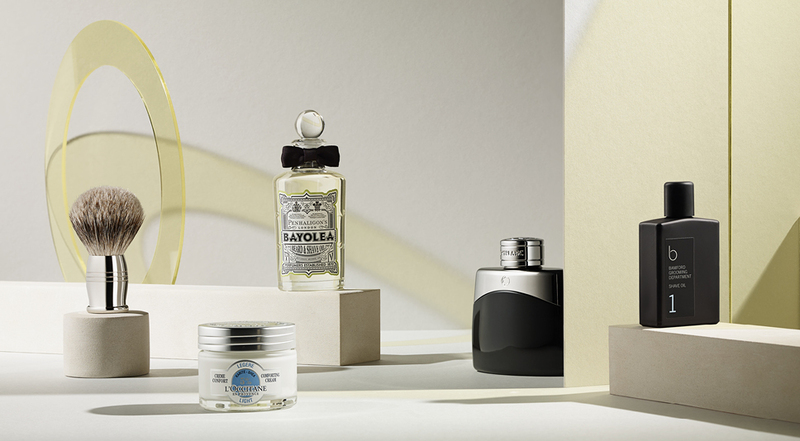 Blending spice and sweet in an ode to the Caribbean, Bayolea is one of Penhaligon’s classic fragrances. It features head notes of citrusy lemongrass and mandarin, heart notes of spicy cardamom and black pepper and a sensual base of musk, sandalwood and patchouli, creating a sophisticated scent. Whatever your preference when it comes to facial hair, a good everyday moisturiser is an essential for all. L’Occitane’s Shea Light Comforting Face Cream (£28) has long been a fond favourite to many, and is especially suited for use during the summer. It’s perfectly suited to normal or combination skin with a fresh and light texture that won’t feel heavy or sticky during the warmer months. Dab a little on the palm of your hand to warm it up, and apply in an upward motion, not forgetting to include your neck and chest. Add a finishing touch before you head out with a spray of eau de toilette. For a fresh fragrance that’s perfect for summertime, Montblanc’s Legend (£27) marries lavender, citrus and bergamot with white cedar, rose, jasmine, oak and sandalwood to create a clean and lively signature scent. Visit The Royal Exchange’s boutiques to sample this selection for yourself, or discover your own signature fragrance and grooming products with the assistance of experienced advisors who can help you devise a regime that’s perfectly tailored to your preferences.